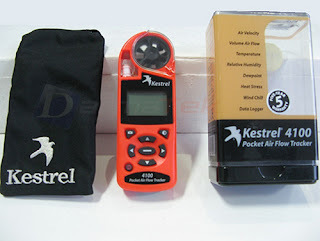 The Kestrel 4100 Pocket-AirFlow-Meter was engineered specifically with the HVAC technician' s many needs in mind. In addition to measuring volume air flow, this multi-functional precision instrument also measures temperature, relative humidity and dewpoint, either ambient or in any accessible airflow. Tired of cumbersome equations to calculate CFM? Enter the duct shape and dimensions. Hold the 4100 in the air flow. The Kestrel 4100 Pocket-Airflow-Meter features a powerful data logger that records 2000 sets of measurements at user-selectable time intervals ( over 2 years of data can be recorded) . Logged data can be reviewed with the 4100' s on-screen graphing capabilities, or uploaded to a PC for in-depth review. The optional Kestrel Interface and accompanying Kestrel Communicator software makes long-term storage, in-depth analysis and detailed charting of stored data a breeze.